(From left) Ralf Speth, Global CEO, Jaguar Land Rover; Guenter Butschek, CEO & MD, Tata Motors; Mayank Pareek, president for passenger vehicles, Tata Motors and Girish Wagh, head, commercial vehicles, Tata Motors, in Mumbai on Thursday. 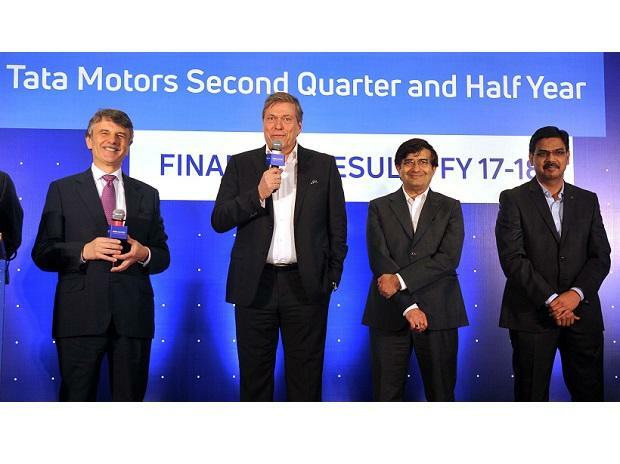 Tata Motors posted better than expected numbers for the September quarter, led by robust volume growth and an improving product mix, especially at Jaguar Land Rover (JLR), its UK-based subsidiary. 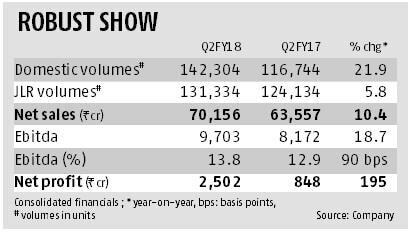 Consolidated revenue at Rs 70,156 crore, up 10 per cent over a year before, was led by six per cent volume growth at JLR and an impressive 22 per cent growth at the domestic entity. While volumes for JLR were led by the launch of the Range Rover Velar and a 19 per cent jump in China sales, domestic sales were led by commercial vehicles (CVs), up 26 per cent. JLR contributes about 80 per cent to the consolidated revenues. Higher volume growth and product mix helped a 19 per cent growth in operating profit for the consolidated entity. While the operating profit margin for JLR improved 90 basis points (bps) to 11.8 per cent, those for the domestic entity more than doubled to 7.2 per cent. For JLR, the key reasons for the higher margin performance were higher volumes, richer product mix and increased sales from higher margin markets such as China. While material and operating cost efficiencies helped, what pegged back the margin gains a bit were higher dealer commissions and increased depreciation and amortisation expenses at the earnings before interest and taxes (Ebit) level, on account of the new Discovery and Velar launches. Higher revenues and margins led to tripling of net profits to Rs 2,502 crore. On the foreign exchange hedges which have been impacting its revenue and margin, the company indicated the outstanding hedges stand at £1.09 billion as compared to £2.44 billion a year before. Hedge losses in the September quarter were at £343 million compared to £454 million in the June quarter. If the current exchange rates stay, the hedges are expected to be unwound over the next 12 months. While volume growth is expected to be strong, the company expects margins pressure to remain in 2017-18, due to higher incentives and launch costs. The Ebit margin was 5.2 per cent; the target is eight to 10 per cent over the medium term, on the back of operating leverage, cost efficiencies and new models. An analyst at a domestic brokerage says it is possible to meet the target over the next two years, led by better product mix (newer models), rationalisation of its platform and higher volumes. The key would be to balance the higher cost of developing electric vehicles with the existing portfolio. In the near term, however, the company could face some volume pressure at JLR, with the coming refreshes for the Range Rover and Range Rover Sport. Given the lower stock of older models, the company recorded flat retail sales growth for JLR in October. Analysts expect volume to recover in the March quarter, the strongest ones for JLR. Effort to turn around the domestic business has led to an improvement in volumes and a gain in market share. The management indicated new launches, selective catalytic reduction technology and marketing helped to improve its CV market share by 3.9 per cent over the June quarter. Sales in September were its highest on a monthly basis in CVs over three years. The company is hoping the recent CV growth, led by higher investments in infrastructure, restriction on overload of trucks and increasing demand for higher tonnage vehicles, will continue. In the passenger vehicle space, new products such as the Tata Nexon compact SUV and recent launches such as the Hexa, Tigor and Tiago are expected to keep volume growth robust. The challenge is to sustain the growth momentum. While CV sales were up seven per cent in October, year on year, passenger vehicle sales grew only one per cent.